Home Tags Posts tagged with "pedlar"
I use my pedal exerciser at home while watching t.v. and it works great. And we certainly sell plenty of pedlars and stationary bikes to elderly, recuperating and mobility-challenged customers, but who would think to use it while working at a desk? MSN health writer Diane Mapes did! Does it work? Read Teeny Bike Pedals Away ‘Sitting Disease’ Fears – msnbc.com. So, I guess it is official. Allegro Medical’s Resistive Pedal Exerciser Stationary Bike ($26.95) may be your answer to pedaling your bottom off while you work. Will a Pedlar work for you? Even if you can’t manage it under your desk, you can use it all sorts of places. 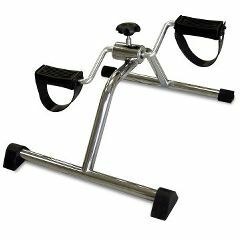 Pedlar exercisers are transportable, generally inexpensive and span a large range of options. Order one today and we’ll ship it to your doorstep.